Unemployment rates look bleak around the world. In the USA, it has been hovering around 9.5% for 14 months straight. So, what could big companies do to make a difference? Two students, Rodrigo de Castro and Joan Unzer, came up with this concept for a Starbucks campaign. 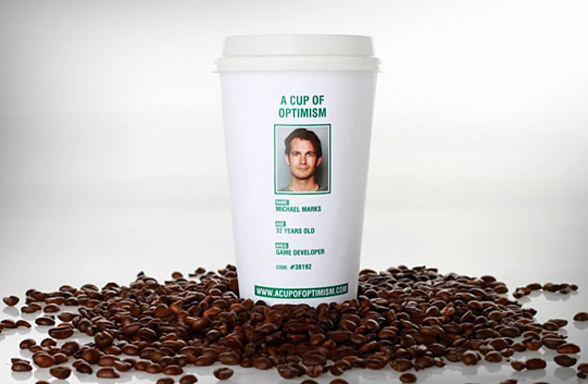 Unemployed people could print their resumes on Starbucks coffee cups, potentially reaching a huge audience of business people every day. It is a brilliant concept. Ones of those fancy win-win ones. Some of the unemployed might get a job, while the loyalty towards Starbucks would increase substantially. The social effect alone would be staggering. The idea is very creative and is a great story, but it is not a program we currently have in place. Mmmmm... well, get cracking Starbucks! In the meantime, Starbuck did once again celebrate Earth Day (today), by awarding people who use a reusable coffee mug with a free brewed cup of coffee or tea.